For the film, see The Battle for Marjah (film). Operation Moshtarak (Dari for Together or Joint), also known as the Battle of Marjah, an International Security Assistance Force (ISAF) pacification offensive in the town of Marjah, Helmand Province, Afghanistan. It involved a combined total of 15,000 Afghan, American, British, Canadian, Danish, and Estonian troops; constituting the largest joint operation of the War in Afghanistan up to that point. The purpose of which, to remove the Taliban from Marja, eliminating the last Taliban stronghold in central Helmand Province. The main target of the offensive was the town of Marjah, which had been controlled for years by the Taliban as well as drug traffickers. Although Moshtarak was described as the largest operation in Afghanistan since the fall of the Taliban, it was originally supposed to be the prelude to a much larger offensive in Kandahar that would follow Moshtarak by several months. ISAF chose to heavily publicize the operation before it was launched, comparing its scope and size to the 2004 Second Battle of Fallujah, in the hopes that Taliban fighters in the town would flee. The operation was also designed to showcase improvements in both the Afghan government and Afghan security forces. ISAF claimed that the operation was "Afghan-led" and would use five Afghan brigades. General Stanley A. McChrystal, the commander of ISAF, also promised that following the offensive ISAF would install a "government in a box" in Marja. While initially successful, ISAF and the Afghans failed to set up a working government in the town, leading to a successful resurgence by the Taliban; 90 days into the offensive General McChrystal famously referred to it as a "bleeding ulcer". In October the town was still described as "troubling", but by early December the fighting there was declared "essentially over". The operation was called "a key test" of the coalition strategy against the Taliban insurgency. Brigadier James Cowan, the commander of British forces in Helmand, believed it would mark "the start of the end of this insurgency". At the very least it would become a test of whether the Afghan forces would be able to make their country peaceful and safe. The announcement of the operation was also a part of this strategy: "shaping the information battlefield strategic communications", and to ensure it would not repeat the destruction of Fallujah in Iraq in 2004. Hours before the offensive began, Afghan and coalition forces dropped leaflets with the message, "Do not allow the Taliban to enter your home". After this operation in Helmand province, the neighbouring province and the city of Kandahar became a target of American operations. In March 2010, U.S. and NATO commanders released details of plans for the biggest offensive of the war against the Taliban insurgency. When launched, the operation was called a "new war model". Afghan and NATO officials had assembled a large team of Afghan administrators and an Afghan governor that would move into Marja after the fighting, with more than 1,900 police standing by. "We've got a government in a box, ready to roll in", said American commander Stanley McChrystal. The capture of Marja was intended to serve as a prototype for a new type of military operation. The Afghan government had pledged to hold any territory seized in the Taliban heartland during the assault. Utilities engineers were on hand to ensure power and water supplies were maintained. As early as September 2009, Canadian soldiers from 3 Princess Patricia's Canadian Light Infantry began training about 400 Afghan National Army recruits for the operation. Since January 2010, coalition forces had launched smaller "shaping operations" to prepare for the main assault on February 13. One of these operations was a series of "find, fix, strike" raids by four-man SAS teams and U.S. Army Special Forces team ODA 1231. These resulted in the deaths of 50 Taliban leaders in the area according to NATO, but didn't seem to have any real adverse effect on the Taliban's operations. In another operation, the Scots Guards and Grenadier Guards captured a bomb factory and defused 20 IEDs. The Afghan public was warned of the upcoming operation, in line with new rules of engagement for British forces, called "courageous restraint." 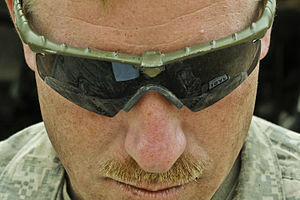 The tactic, conceived by U.S. General Stanley McChrystal and British Major General Nick Carter, required soldiers to "use brain-power rather than fire-power" and hoped to reduce damage to the Afghan population (in terms of collateral and life cost) by using fewer munitions and support measures. 11 Light Brigade, the main British formation in Helmand for use in the counter-insurgency role tested the doctrine in some of the more heavily populated areas in Helmand. The publicity and the new tactics intended to prevent the loss of civilians, and to persuade insurgents to lay down their arms. The operation was the first in Helmand since the surge of 30,000 U.S. troops and additional British reinforcements in late 2009/early 2010. The main force was the 2nd Marine Expeditionary Brigade (Task Force Leatherneck) as well as British Soldiers from 1 Coldstream Guards Battle Group, 1 Grenadier Guards Battle Group, 1 Royal Welsh Battle Group all supported by Close Support Combat Engineers from 28 Engineer Regiment; elements of the United States Army; and Afghan National Army and Afghan National Police forces. British Forces focused on the Lashkar Gah district and Nad Ali district, and U.S. forces on the town of Marja. U.S. assault forces included the 1st Battalion, 3rd Marines and 1st Battalion, 6th Marines, 3rd Battalion, 6th Marines, 3rd Battalion, 10th Marines, 2nd Combat Engineer Battalion, and elements of 2nd Assault Amphibian Battalion and 2nd Light Armored Reconnaissance Battalion The operation also intended to cut the opium trade. Its main aim was to ensure that captured ground can be held by British and American troops, enabling the Afghan government and civilian aid agencies and military contractors to work more effectively in the province. A majority of the US forces were inserted by CH-53 and MV-22 helicopters, while the rest conducted a ground assault. The Canadian Forces focused on the air assault with seven helicopters, including three CH-147 Chinook escorted by four CH-146 Griffon. The Joint Task Force Afghanistan (JTF-Afg) ferried about 1,100 coalition troops to Nad Ali District in the largest air assault ever conducted with Canadian helicopters. 33 other coalition helicopters, supported by fighter jets and uncrewed aerial vehicles, also participated in the operation with a total of 11 waves of troop drops. Ahead of the military operation, hundreds of civilian families fled Marja and its surroundings and were displaced from their homes due to the offensive by NATO and their Afghan partners. The town was suspected to be "one of the biggest, most dangerous minefields NATO forces have ever faced," and hundreds of the beleaguered insurgents could insist to fight until death. By early January the surge forces which President Obama had announced on December 1, 2009, had arrived in country. The bulk of the Marine forces included the 1st and 3rd Battalion of the 6th Marine Regiment. They quickly setup command at Camp Dwyer, south of Marjah. They were joined with Afghan Army units and began training and preparing for their mission in Marjah. At the same time a small task force, A SQN The Household Cavalry Regiment would begin to secure the main road from Lashkargah around local police compounds at the main t-junction, which divides the main road North to Nad-e-Ali and South to Marjah. With 3 Troop tasked to move on a dirt track in a 12 man team in Scimitar's and 2 pick up's with a Tiger Team SF team, to prove a potential cross country route towards Marjah and probe the Taliban in the Bolan Desert in the weeks leading up to the Moshtarak. As the assault drew near, US and coalition forces began to encircle the city in order to screen those entering and exiting, gather intelligence, and deceive the enemy as to the avenue of approach for the well publicized assault. 1st Battalion, 6th Marines moved command to Fire Base Fiddlers Green, home of 3rd Battalion, 10th Marines just southeast of Marjah, the 3rd Battalion, 6th Marines built temporary Camp Belleau Wood just northwest of the city, and Bravo Company, 2nd Assault Amphibian Battalion and Alpha Company, 2nd Light Armored Reconnaissance Battalion filled the desert to the west. At the same time a small task force, A SQN The Household Cavalry Regiment (HCR) would begin to secure the main road from Lashkargah around local police compounds at the main t-junction, which divides the main road North to Nad-e-Ali and South to Marjah. With 3 Troop tasked to move in a 12 man team in 4 Scimitar's and 2 pick up's with a Tiger Team SF team, to prove a potential off road route towards Marjah from the East and probe the Taliban in the Bolan Desert in the weeks leading up to the Moshtarak. In these weeks 3 Troop would encounter resistance each day and found dozens of IED's along the route. Sleeping next to the vehicles at night left allowed them to stay mobile but the Taliban were determined to no avail. At the same time 2 TP HCR (12 man team) would encounter a force of 35 Taliban moving South to Marjah, stopping them with help from Apache support. In preparation for the major offensive, 1st Battalion, 3rd Marines seized the "Five Points" junction east of Marja on the road to Lashkar Gah. Elements of Charlie Company were inserted by air under cover of darkness, while elements of Bravo Company, along with 1/3's Combat Engineer Platoon, traveled 9 kilometers on foot from their bases in the Nawa district, sweeping the road for explosive devices. While repelling Taliban assaults, the Marines built a combat outpost, completed on February 14, that they named COP Reilly. The 1/3 Marines held COP Reilly and the northeastern outer sector of Marjah until February 25, when Kilo Company, 3rd Battalion, 6th Marines arrived to take control of the position. On February 11, forces staged all around the city and at the major airbases ready for the next day's assault. Hours before midnight the Afghan President Hamid Karzai had given his personal approval for the operation, that had been delayed for 24 hours as Afghan officials entered last minute negotiations with insurgents. February 12 was the original D-day, but after a 24-hour delay to for negotiations, forces were on a standout and had one extra day for preparation. 1st Battalion, 6th Marines board CH-53E Super Stallion on February 13. Hours before dawn, US and Afghan special operations forces inserted into two key target sites in the southwest corner of Marjah. They would be isolated until Marines, Soldiers, and Afghani troops from Task Force 3/4/205 could link up. Just prior to dawn, the landing waves of helicopters across central Helmand marked the start of the major offensive. Third Battalion, 6th Marines were inserted into the northern part of the city and 1st Battalion, 6th Marines in the center of the city. In the southern edge, Task force 3/4/205 conducted a ground breach and companies of 1st Battalion, 6th Marines also conducted a ground breach from the southeast. On February 13, two hours before dawn at 4 am local time the first of 90 Chinook and Cobra helicopters disgorged a force of British, Afghan and French troops. The US Special Forces ODA's 1231 and ODA 3121 had been on the ground for hours prior to the main push seizing control of their objectives. The Special Forces then advanced north into the city meeting heavy resistance and capturing further objectives. The advance into Marja was slowed during the morning through poppy fields lined with home-made explosives and other land mines. The first kills were reported to be made by uncrewed Predator aircraft and AH-64 Apache attack helicopters, targeting insurgents seen laying roadside bombs and setting up anti-aircraft guns. At 2 am local time the troops from the U.S. Marine Corps seized a series of canal crossings south of Nad-e-Ali. Within minutes, the U.S., British and Afghan special forces seized and secured dozens of helicopter landing sites. Most notably U.S. Army Special Forces ODA 1231 along with Afghan Commandos from 3rd Commando Kandak took control of the southern tip of the city, being the first boots on the ground. At 2:25 am Chinooks approached, flown by pilots with night vision equipment and guided by infra-red flares, dropped from U.S. Marine KC-130's. At about 4 am, RAF Chinooks full of soldiers from the 1st battalion the Royal Welsh left Camp Bastion, the main British base in Helmand, for the Pegasus landing zone in the Taliban stronghold of Showal in the Chah-e-Anjir area. At the same time the British Manoeuvre Support Group consisting of the Viking Gp, Close Support Armoured Engineers (including the first deployment of Trojan Armoured vehicles) and Route opening capabilities departed for the Op Moshtarak AO. While the British force began to secure their area, a 1,000-strong combined force of members of the U.S. Marine Corps and the Afghan National Army landed in Marja. During the following 90 minutes, more Marines arrived in waves of CH-53 Super Stallion transport helicopters. By daybreak, hundreds more soldiers began to enter the area by land, using mobile bridges and Assault Breacher Vehicles. Major General Nick Carter, commander of NATO Regional Command South in southern Afghanistan, said Afghan and coalition troops made a "successful insertion" without incurring any casualties. While the U.S. Marines and Afghan soldiers stormed the town of Marja, British, American and Canadian forces struck in the Nad Ali district. General Sher Mohammad Zazai, commander of the Afghan troops in the south, said Afghan and NATO forces had established positions in 11 of 13 targeted areas in and around Marja and were slowly pushing forward. When invading Marja, the invading troops confiscated caches of weapons and ammunition. The greatest obstacle was the extensive network of mines and booby traps. The assault troops were reported to run into "a huge number" of improvised explosive devices when crossing a canal into the town's northern entrance. Marines and Army used portable aluminium bridges to span the irrigation channels. Mobile bridges enabled the safe crossing of the main canal into Marja, since the existing bridge was expected to be rigged with explosives. Marine engineers moved forward in special mine-clearing Assault Breacher Vehicles. These 72-ton, 40-foot (12-meter)-long vehicles, fitted with a 15-foot (4.5-meter)-wide plow supported by metallic skis that glide on the dirt, and nearly 7,000 pounds (3,175 kilograms) of explosives, ploughed a path through fields and dug a safety lane through the numerous minefields laid by the Taliban. To clear minefields and ignite roadside bombs, the Marines also launched rockets which deploy cables of plastic explosives, called M58 MICLIC. On the first day of the operation, Qari Yousef Ahmadi, a spokesman of the Taliban, said that insurgents were still resisting in Marja in hit-and-run tactics against ISAF forces. Mullah Mohammed had told ABC News that the Taliban were retreating to reduce civilian casualties. By nightfall, it was claimed by ISAF sources that Marines "appeared to be in control" of the centre of Marja. British forces moving into the Nadi Ali and western Babaji regions encountered small 'stay-behind' pockets of resistance, although most Taliban fighters had already retreated to other areas in Helmand. Number One Company of the 1st Battalion Coldstream Guards advanced several kilometers into the region on foot from Patrol Base 4 in Babaji. The guardsmen manpacked FGM-148 Javelin missiles which were used decisively to defeat the Taliban resistance left in the area. Gulab Mangal, the governor of Helmand, said it was "the most successful operation we have ever carried out", but warned that the complete military operation could take a month. However, General McChrystal later called the offensive in Marja a "bleeding ulcer" after 90 days into the offensive. Marines and Afghan National Army soldiers take cover in Marja on February 13. On the morning of February 14, 2010, a report of the Australian newspaper Herald Sun under the headline "Opium city captured" claimed the seizure of Marjah, "source of most of the world's opium", by the Afghan and ISAF forces. However, Reuters reported that a small flag-raising ceremony at one of the Afghan and ISAF compounds on the morning of February 14 drew gunfire, suggesting that the insurgents remained defiant. After American, Afghan and British troops seized crucial positions, having first overwhelmed most immediate resistance, they encountered "intense but sporadic" fighting as they began house-to-house searches. The pattern suggested that the hardest fighting was still to come. According to American commanders the troops had achieved every first-day objective, including advancing into the city itself and seizing strategic points like intersections, government buildings and one of the city's bazaars in the center. The following searching door to door for weapons and insurgents is expected to last at least five days, with possibly hundreds of bombs and booby-traps in houses and on roads and foothpaths as the biggest concern. On this second day of the operation British troops pushed through Showal, the town that for the last two years was under the control of insurgents who used it as a staging post to build bombs and to train their fighters to plant them. In factory raids explosives for numerous improvised explosive devices were seized. Not only bomb-making equipment, but also drugs and heroin-processing chemicals were found in surrounding field belonging to Opium farmers. Among the drugs seized were 17 tons of black tar opium, 74 tons of opium poppy seeds, 400 pounds of hashish and 443 pounds of heroin. Twelve civilians, 10 of whom were from the same family, were killed when civilian houses in Marja were struck by two rockets fired by a NATO High Mobility Artillery Rocket System (HIMARS). All use of the rocket system was stopped by NATO commanders, the American general McChrystal telephoned Afghan President Hamid Karzai to apologize for what he called the "unfortunate incident" and the latter called for an investigation. Major General Nick Carter stated however that the rockets were on target and the house was used by the Taliban for staging attacks. On the morning of the third day of the operation, the American general Stanley McChrystal visited the former "insurgent capital" of Showal, where after two years the white flag of the Taliban was replaced with the red, green and black national flag. While the British 50-square-mile (130 km2) sector of northern Nad-e-Ali had fallen easily, the American troops were still pushing through Marja a few miles away where the insurgents are putting up a "final stand". According to American and Afghan commanders, the number of insurgents in the area had dropped by about half. About a quarter of the 400 Taliban fighters estimated to be in Marja at the beginning of the operation had been killed. Another quarter appeared to have reatreated to other areas or have fled the area, including some of the commanders. In Marja itself fighting continued in two areas, at the northern end of the district and at the center. After the town of Showal was captured following the launch of Operation Moshtarak, a threat was perceived by the ISAF forces of suicide or other bombing attacks by insurgents, attempting to reassert their presence in defiance of the media focus on the town's recapture. On February 18, 2010, Afghan soldiers raised the Afghan national flag over the badly damaged bazaar in Marja which had been the target of ISAF and Afghan army attacks, after driving back Taliban snipers on their third attempt, witnessed by the top Afghan general in Helmand and the provincial governor. The same day, there were reports about a meeting of Afghan government officials with Taliban representatives in the Maldives that had taken place at the end of January. U.S. Marines with Bravo Company, 1st Battalion, 6th Marine Regiment return fire on enemy forces in Marja. In the south of the city near the Balakino Bazaar, where soldiers and Marines from Task Force 3/4/205 had been clearing since D-day, a major fight broke out as they struggled to clear the last major intersection. Members of Army Special Forces ODA 3121 along with Marine engineers and partnered Afghan commandos began to fight their way west from the Balakino Bazaar (Objective Thunderdome, what would be called COP McQueary and later COP Azadi) to the last major Taliban Intersection (Objective Olympia). At the same time, Marines from 3rd Platoon, Bravo Company, 2nd AABn (aka MRAP Company) pushed north towards Olympia from COP Radford at the southern entrance of the city. Encountering heavy rocket-propelled grenade, small arms, and indirect fire the forces moved into the intersection which consisted of a small bazaar and International Red Cross clinic, surrounded by several canals and guarded by fighting bunkers. Once the intersection was secured, the engineers began clearing the areas of IEDs. When clearing the bazaar, opening a booby-trapped door triggered an explosion, killing Lance Corporal Larry Johnson and Sergeant Jeremy McQueary, both of 2nd Combat Engineer Battalion, and wounded five other Marines. MRAP Company occupied the intersection and eventually developed COP Olympia. For his actions leading the assault to COP Olympia, Army Staff Sergeant Corey Calkins was awarded the Army Distinguished Service Cross (Navy Cross equivalent), which is the second-highest medal awarded in Marjah. Following the explosion of the booby-trapped door the Marines and other nearby US forces inspected nearby homes, and apprehended an individual from a home they thought contained material that could be used to construct a bomb. A cooperative local elder identified the prisoner as a member of the Taliban. In 2015 Mathew Golsteyn was discharged from the Army, and had a letter of reprimand left in his personnel file, over the death of this prisoner. During a 2016 interview, on FOX News Golsteyn provided a description of the prisoner's death that led to murder charges, in December 2018. A Marine with Bravo Company, 1st Battalion, 6th Marine Regiment return fire on enemy forces in Marjah using an M72 LAW. After 12 days, on the morning of February 25, 2010, there was another flag rising ceremony. The Australian newspaper The Sydney Morning Herald reported that an AFP photographer mentioned the rising of the Afghan flag on a building at the Marja bazaar by Mohammad Gulab Mangal, governor of Helmand province, watched by Brigadier General Larry Nicholson, the commander of the US Marines in southern Afghanistan. This ceremony was attended by a crowd of several hundred inhabitants of the 125,000 inhabitants of the town and were guarded by US Marine snipers on the roofs of buildings. Nicholson and Mangal, accompanied by Major General Nick Carter, the British commander of NATO forces in southern Afghanistan, arrived in Marja early that day by helicopter from Camp Bastion. On March March 16, 2010, an assessment by the Afghan Red Crescent Society (ARCS) claimed that the conflict in Marja had left 35 civilians dead, 37 injured, and 55 houses destroyed – without specification which side killed how many civilians. Except for some "small pockets of resistance", Taliban fighters had been driven out of the town, but many inhabitants were struggling to return to some kind of normality. Before and during the military operation they were promised rapid aid, but some three weeks after the end of the offensive local people said that they had yet to receive any meaningful assistance. Marines from Bravo Company, 2nd Assault Amphibian Battalion return fire on the Taliban during Operation Moshtarak. According to reports, sniper fire and bomb explosions in Marja three or four times daily were a sign that the insurgents had not given up despite losing control of the town. New bombs were planted every night, even though Marines said they could dismantle most of them. Lt. Col. Calvert Worth, commander of the 1st Battalion, 6th Marine Regiment, said that his troops found or hit more than 120 homemade bombs in their first 30 days in Marja. Four months after the start of the operation, a lack of security for local population cooperating with ISAF troops and the eruption of gun battles "almost daily" have been reported. Four months after the offensive the former Taliban stronghold, that was intended to become a showpiece of what Western military might and ramped-up Afghan government services could accomplish, became something of a cautionary tale. Insurgents undermined a return to normal life, intimidating bakers who supplied American troops. Operation Moshtarak was declared officially over and the city secured, however Coalition troops would continue to fight in Marjah until 2013. As of February 18, Coalition forces have not released, or given any more statements about estimates of Taliban casualties during this operation. In the first five days of fighting an anonymous US intelligence source estimated at least 120 Taliban fighters were killed engaging Coalition and Afghan forces in Marja during the operation. By early December, 61 US, UK and Afghan soldiers were reported killed in the district as part of the operation. However, the Afghan national army almost never gave out their fatality figures so the number of Coalition dead could be higher. The numbers of Coalition and Taliban wounded in action have not been released or publicly estimated thus far. U.S. Marines with Charlie Company, 1st Battalion, 6th Marine Regiment patrol the poppy fields in Marja. After the ousting of the Taliban, the American and NATO commanders were confronted with the dilemma of on the one hand the need for "winning the hearts and minds" of the local population as well as on the other hand the necessity of the eradication of poppies and the destruction of the opium economy, that allegedly financed the Taliban insurgency. Since opium is the main source of existence of 60 to 70 percent of the farmers in Marja, American Marines were ordered to preliminarily ignore the crops to avoid trampling their livelihood. A combined force of 15,000 is involved in Operation Moshtarak. This combined force includes: Approximately five brigades of Afghan forces, including members of the Afghan National Army, Afghan National Police, Afghan Commandos and the Afghan National Civil Order Police. U.S. Marines with Bravo Company, 1st Battalion, 6th Marine Regiment patrol the fields in Aftermath. In March 2010, when the major clearing operations were over, the 2nd Marine Expeditionary Brigade turned over the Helmand Province to the much larger I Marine Expeditionary Force (FWD). By the summer, most of the initial assault units of 2nd MEB were replaced by the units of I MEF (FWD). The official end to Operation MOSHTARAK was December 2010, though units stayed in the city for the years after. Navy Presidential Unit Citation, awarded to the 2nd Marine Expeditionary Brigade for its operations in the Helmand Province in 2009-2010, to include Operation MOSHTARAK. For the actions of the 2nd Marine Expeditionary Brigade, primarily Operations MOSHTARAK AND KANJAR, Secretary of the Navy Ray Mabus awarded the Presidential Unit Citation, a unit award equivalent to the personal Navy Cross. This is the first Marine-led unit to receive the citation since the I Marine Expeditionary Force was awarded it for its actions in the 2003 assault into Iraq. Marine Corporal Kyle Carpenter was awarded the Medal of Honor on June 19, 2014, for his actions in Marjah. On July 2010, Lance Corporal Kyle Carpenter, of 2nd Battalion, 9th Marine Regiment, deployed to Marjah in support of Operation Enduring Freedom. On November 21, 2010, while joining his team to fight off a Taliban attack in a small village the Marines had nicknamed Shadier between two villages nicknamed Shady and Shadiest, He suffered severe injuries to his face and right arm from the blast of an enemy hand grenade; after-action reports state that he threw himself in front of the grenade to protect a fellow Marine. On June 19, 2014, Corporal Carpenter received the Medal of Honor at a ceremony in the White House in Washington, D.C. In 2011, then US Army Captain Mathew L. Golsteyn was awarded a Silver Star, for actions in February 2010; however, the award was revoked in 2015, after an investigation into an undisclosed rules-of-engagement violation by Golsteyn in 2010. The 2017 film War Machine, starring Brad Pitt, portrays a fictionalized version of the events surrounding the Battle of Marjah. The Battle of Marjah Veterans Facebook page is a community of almost 3,000 Marjah veterans and family. A Reuters photograph, by Goran Tomasevic, featuring Marines from Bravo Company, 1st Battalion, 6th Marines, Lance Corporal Chris Sanderson and Sergeant Travis Dawson protecting an Afghan man and his child after Taliban fighters opened fire went viral across social media, often being featured as a meme discussing the difference between the Taliban and coalition troops. ^ "Nato hails major Afghan operation". BBC (2010-02-13). Retrieved February 14, 2010. ^ "Afghanistan offensive on Taliban in Helmand". BBC (2010-02-13). Retrieved February 13, 2010. ^ a b "UK role in Operation Moshtarak 'goes to plan', MoD says". BBC News. February 14, 2010. Retrieved February 14, 2010. ^ "Assault on Taliban in southern Afghanistan begins NATO". Yahoo! News. February 12, 2010. Archived from the original on February 20, 2010. Retrieved February 15, 2010. ^ "Taliban getting ready for major fight". Dawn. Reuters. February 8, 2010. Archived from the original on February 9, 2010. Retrieved February 10, 2010. ^ "Operation Moshtarak: Assault in Helmand province". BBC (2010-02-13). Retrieved February 13, 2010. ^ "icasualties count". June 15, 2010. ^ "Over 120 Taliban militants killed in southern Afghanistan". ^ "U.S., Allies Responsible for Most Marjah Civilian Casualties". Rethinkafghanistan.com. Retrieved January 16, 2012. ^ Thompson, Mark (February 9, 2010). "U.S. Troops Prepare to Test Obama's Afghan War Plan". Time. Retrieved February 11, 2010. ^ Trofimov, Yaroslav (February 1, 2010). "U.S. Plans Defense of Kandahar". Wall Street Journal. Retrieved September 24, 2012. ^ Nordland, Rod (February 4, 2010). "Military Officials Say Afghan Fight Is Coming". New York Times. Retrieved September 24, 2012. ^ "Operation Moshtarak" (PDF) (Press release). ISAF Joint Command – Afghanistan. February 13, 2010. Archived from the original (PDF) on January 7, 2011. Retrieved September 23, 2012. ^ Shachtman, Noah (May 25, 2010). "Marjah's 'Government in a Box' Flops as McChrystal Fumes". Wired.com. Retrieved September 24, 2012. ^ a b Nissenbaum, Dion. "Mcclatchydc.com". Mcclatchydc.com. Retrieved January 16, 2012. ^ Seib, Gerald (June 23, 2010). "A Critical Moment in War Effort". Wall Street Journal. Retrieved September 24, 2012. ^ Lamothe, Dan (October 3, 2010). "76 Marines killed in Afghanistan since May 1". Marine Corps Times. Archived from the original on November 5, 2013. Retrieved September 23, 2012. ^ Martinez, Luis (December 7, 2010). "Marine General: The Fight for Marjah is 'Essentially Over'". ABC News. Retrieved September 23, 2012. ^ Michaels, Jim (February 11, 2010). "Marjah fight geared for Afghan civilians' safety". USA Today. Retrieved January 16, 2012. ^ Filkins, Dexter (February 11, 2010). "Afghans Try to Reassure Tribal Elders on Offensive". The New York Times. Marja (Afghanistan). Retrieved January 16, 2012. ^ "Marja offensive a test for NATO's ability in uprooting Taliban". News.xinhuanet.com. Retrieved January 16, 2012. ^ "Maybe this is the end of the beginning". The Times. UK. Retrieved January 16, 2012. ^ Marcus, Jonathan (February 11, 2010). "Afghanistan conflict an 'information war'". BBC News. Retrieved January 16, 2012. ^ Georgy, Michael (February 11, 2010). "Afghan campaign seeks to avoid Iraq mistakes". Reuters. Retrieved January 16, 2012. ^ Tim Reid (2010-02-13). "Troops start 'make or break' assault on the Taleban". The Times. ^ Gall, Carlotta (March 26, 2010). "Kandahar Becomes Battlefield Before a U.S. Offensive". The New York Times. Kandahar (Afghanistan). Retrieved January 16, 2012. ^ Graff, Peter (March 31, 2010). "Q+A – NATO sees Kandahar battle as Afghan turning point". In.reuters.com. Retrieved January 16, 2012. ^ "Battle for town is a small step on the path to victory". The Times. UK. Retrieved January 16, 2012. ^ Sanger, David E. (February 13, 2010). "A Test for the Meaning of Victory in Afghanistan". The New York Times. Marja (Afghanistan);Afghanistan. Retrieved January 16, 2012. ^ "'Here to stay' says Afghan government". Euronews.net. February 13, 2010. Retrieved January 16, 2012. ^ Ward, Olivia (February 27, 2010). "Canadians played key role in Marja attack". Toronto Star. Retrieved March 1, 2010. ^ a b Wyatt, Caroline (January 28, 2010). "Restraint the new tactic for UK troops in Afghanistan". BBC News. Retrieved February 6, 2010. ^ a b c Wyatt, Caroline (February 5, 2010). "UK Afghanistan forces 'soften up' Taliban targets". BBC News. Retrieved February 6, 2010. ^ John Vandiver. "Marines poised for Marjeh offensive". Stripes.com. Retrieved January 16, 2012. ^ "Marines fight insurgents, secure key intersection on road to Marja". Marines.mil. Archived from the original on June 29, 2011. Retrieved January 16, 2012. ^ C. J. Chivers (February 12, 2010). "In the Cold of Morning, Descending Into Conflict". The New York Times. Marja (Afghanistan);Helmand Province (Afghanistan);Afghanistan. Retrieved January 16, 2012. ^ "NATO offensive launched". Canadian Broadcasting Corporation. November 11, 2009. Retrieved February 12, 2010. ^ "Importante offensive antitalibane" (in French). Radio-Canada. November 11, 2009. Retrieved February 12, 2010. ^ "Coalition attacks Taliban stronghold". Canadian Broadcasting Corporation. November 11, 2009. Retrieved February 12, 2010. ^ "Canadians play key role in NATO offensive". Globe and Mail. Canada. February 13, 2010. Archived from the original on May 27, 2012. Retrieved February 13, 2010. ^ "Afghanistan Says Ready If Thousands Flee Assault". Rferl.org. February 10, 2010. Retrieved January 16, 2012. ^ "Marines Wait in the Cold for Afghan Offensive"
^ "Obama approves Afghanistan troop increase". CNN. February 18, 2009. ^ "Accelerated Troop Surge in Afghanistan Faces Logistical 'Challenge'". Fox News. December 1, 2009. ^ "Marines fight insurgents, secure key intersection on road to Marja". Dvidshub.net. Retrieved July 22, 2012. ^ "Marines name new outpost near Marjah for fallen brother". Dvidshub.net. Retrieved July 22, 2012. ^ C. J. Chivers (February 28, 2010). "After Push in Marja, Marines Try to Win Trust". The New York Times. Marja (Afghanistan);Helmand Province (Afghanistan);Afghanistan. Retrieved July 22, 2012. ^ "Afghan interior minister calls on Taliban to give up militancy". News.xinhuanet.com. February 11, 2010. Retrieved January 16, 2012. ^ Harding, Thomas (February 13, 2010). "Operation Moshtarak: first wave of offensive against Taliban strongholds begins- The long-awaited offensive to drive the Taliban from their strongholds in southern Afghanistan began in earnest last night". The Daily Telegraph. UK. Retrieved January 16, 2012. ^ Harding, Thomas (February 13, 2010). "Helicopter armada heralds Afghanistan surge – An armada of helicopters lifted a vast force against Taliban strongholds today in the biggest operation mounted in Afghanistan since 2001". The Daily Telegraph. UK. Retrieved January 16, 2012. ^ Farmer, Ben (February 13, 2010). "Taliban killed in Helmand during fighting in massive Operation Moshtarak". The Daily Telegraph. UK. Retrieved January 16, 2012. ^ Sean Maroney (February 14, 2010). "Five Militants Killed in Afghan Offensive". Islamabad: .voanews.com. Retrieved January 16, 2012. ^ McGirk, Tim (February 13, 2010). "Coalition Forces Launch Afghan Taliban Offensive". Time. Retrieved January 16, 2012. ^ "Nato launches major Afghan assault"
^ Phillips, Michael M. (February 13, 2010). "U.S. Starts Afghan Surge – Invasion of Taliban Territory Puts Obama Strategy to Test; Aid Dollars to Follow". The Wall Street Journal. Retrieved January 16, 2012. ^ Rayment, Sean (February 13, 2010). "Afghanistan: first stage of operation Moshtarak declared a success – The first stage of the biggest military offensive ever launched by Nato troops in Afghanistan has been declared a success as thousands of U.S. and British troops seized a string of Taliban strongholds across central Helmand". The Daily Telegraph. UK. Retrieved January 16, 2012. ^ Hutt, Rosamond (February 13, 2010). "UK troops engaged in Operation Moshtarak". The Independent. UK. Retrieved January 16, 2012. ^ "Afghanistan offensive on Taleban in Marja starts 'without a hitch'". The Times. UK. Retrieved January 16, 2012. ^ a b "Taliban leaders flee as marines hit stronghold". The Times. UK. Retrieved January 16, 2012. ^ "Nato hails major Afghan operation". BBC News. February 13, 2010. Retrieved February 13, 2010. ^ Farmer, Ben (February 13, 2010). "Governor of Helmand: Operation Moshtarak could last a month – Fighting in Operation Moshtarak to clear hundreds of Taliban fighters from a stronghold in Afghanistan's Helmand province could last a month, the governor has warned". The Daily Telegraph. UK. Retrieved January 16, 2012. ^ "Opium city captured". Heraldsun.com.au. February 14, 2010. Retrieved January 16, 2012. ^ Motevalli, Golnar (February 14, 2010). "Afghan flag-raising in NATO offensive draws gunfire". Reuters. Retrieved January 16, 2012. ^ Filkins, Dexter (February 13, 2010). "Allied Troops Seize Taliban Posts; Fighting Is Sporadic". The New York Times. Marja (Afghanistan). Retrieved January 16, 2012. ^ Thomas, By (February 15, 2010). "British troops destroy Taliban bomb making factories – British troops have destroyed a Taliban bomb-making ring after seizing three arms factories in an operation that is likely to have saved scores of soldiers' lives". The Daily Telegraph. UK. Retrieved January 16, 2012. ^ Farmer, Ben (May 24, 2009). "Commandos make record drug seizure in Afghanistan – Afghan commandos backed by US soldiers seized a record haul of more than 91 tons of drugs and killed 60 fighters in an attack on a key insurgent and heroin supply base". The Daily Telegraph. UK. Retrieved January 16, 2012. ^ Laing, Aislinn (February 15, 2010). "Armed Forces head Sir Jock Stirrup says Afghan civilian deaths a 'serious setback' – Air Chief Marshal Sir Jock Stirrup, the head of the Armed Forces, has admitted that the deaths of 12 civilians from Nato rocket attack in Afghanistan is a "very serious setback" for Operation Moshtarak"". The Daily Telegraph. UK. Retrieved January 16, 2012. ^ Aislinn, By (February 15, 2010). "Afghanistan: Operation Moshtarak continues amid rocket ban over 12 civilian deaths – British troops in Afghanistan taking part in Operation Moshtarak will press on with operations in Helmand province amid a ban on a rocket system that killed 12 civilians". The Daily Telegraph. UK. Retrieved January 16, 2012. ^ C. J. Chivers And Rod Nordland (February 14, 2010). "Errant U.S. Rocket Strike Kills Civilians in Afghanistan". The New York Times. Marja (Afghanistan). Retrieved January 16, 2012. ^ "Taliban 'forced from strongholds'". BBC News. February 15, 2010. Retrieved May 20, 2010. ^ Feb 16, 2010 (February 16, 2010). "Operation Moshtarak: missiles that killed civilians 'hit correct target'". The Daily Telegraph. UK. Retrieved January 16, 2012. ^ Harding, Thomas (February 15, 2010). "Operation Moshtarak: Gen Stanley McChrystal visits subdued former Taliban capital – Three days earlier we had been crouching against walls and treading with trepidation down a road that carried the threat of hidden bombs with just our body armour for protection". The Daily Telegraph. UK. Retrieved January 16, 2012. ^ Filkins, Dexter (February 15, 2010). "Half of Town's Taliban Flee or Are Killed, Allies Say". The New York Times. Marja (Afghanistan). Retrieved January 16, 2012. ^ Feb 18, 2010 (February 18, 2010). "Afghanistan battle to remove the Taliban: Operation Moshtarak day-by-day". The Daily Telegraph. UK. Retrieved January 16, 2012. ^ Harding, Thomas (February 16, 2010). "Taliban to attack Nato's trophy conquest town – British forces in the former Taliban stronghold of Showal have been warned of high profile retaliatory attacks in response to the publicity over the capture of the symbolic town". The Daily Telegraph. UK. Retrieved January 16, 2012. ^ "Afghan troops raise flag in key town but Marjah battle not over yet – Reports of talks between Karzai officials and Taliban militants in the Maldives"
^ a b c Todd South (December 13, 2018). "Former Green Beret major faces murder charge for 2010 Afghanistan incident". Army Times. Retrieved December 18, 2018. Golsteyn, a captain at the time, was deployed to Afghanistan in 2010 with 3rd Special Forces Group. During the intense Battle of Marja, explosives planted on a booby-trapped door killed two Marines and wounded three others who were working with the major’s unit. ^ a b Bing West (2011). The Wrong War: Grit, Strategy, and the Way Out of Afghanistan. Random House Publishing Group. ISBN 9781588369321. ^ "Corey Calkins - Recipient - Military Times Hall Of Valor". ^ "Afghan flag raised over town at centre of major assault". News.smh.com.au. February 25, 2010. Retrieved January 16, 2012. ^ IRIN Press release "Afghanistan: Marjah residents take stock after offensive"
^ Green, Matthew (June 26, 2010). "Schools offer hope for progress in Afghanistan". Financial Times. Retrieved January 16, 2012. ^ FROM WIRE REPORTS Laura King, Los Angeles Times (June 26, 2010). "Insurgents bully bakeries in Marjah, Afghanistan, targeting U.S. strategy". Dallasnews.com. Retrieved January 16, 2012. ^ King, Laura (June 25, 2010). "Test of counterinsurgency strategy in Afghanistan". Articles.latimes.com. Retrieved January 16, 2012. ^ "Afghanistan: Marjah battle not yet won". BBC News. June 24, 2010. Retrieved January 16, 2012. ^ "Exploring The Taliban's Complex, Shadowy Finances". Wbur.org. March 19, 2010. Retrieved January 16, 2012. ^ a b c Nordland, Rod (March 20, 2010). "U.S. Turns a Blind Eye to Opium in Afghan Town". The New York Times. Afghanistan;Marja (Afghanistan). Retrieved January 16, 2012. ^ a b "Operation Moshtarak". Dvidshub.net. Retrieved January 16, 2012. ^ "British and US poised to launch 'overwhelming' offensive in Afghanistan". the Telegraph. February 4, 2010. ^ Lamothe, Dan (February 4, 2015). "Army revokes Silver Star award for Green Beret officer, citing investigation". The Washington Post. Retrieved February 7, 2015. ^ Lamothe, Dan (February 6, 2015). "CIA job interview leads to criminal investigation of Green Beret". The Washington Post. Retrieved February 7, 2015. Wikimedia Commons has media related to Operation Moshtarak. Civilian Casualties Mount During US Offensive in Afghanistan – video report by Democracy Now!